Five gallon bucket uses are endless. All paint contractors have an endless supply. The environmentally conscience ones recycle or reuse theirs. I give lots of them away. Sometimes I even clean them first. 1. Storage. 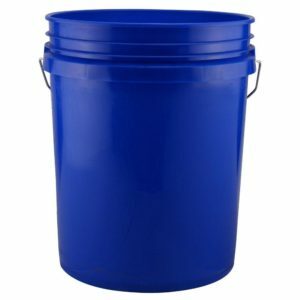 This is the most common use for a clean empty five gallon bucket. We store all kinds of supplies in buckets. 2. Mouse trap. All you need do is go to youtube and you will see how it’s made. I made one and it really works. I use it in my shed in the fall and it works great. 3. Planter. You can grow all kinds of plants in a five gallon bucket. I grow tomatoes and potatoes work well too. 4. Mushroom farm. Kinda the same idea but most people don’t think about mushrooms. Best media to grow them in is coffee grounds. Start saving yours and store them in your freezer or visit your closest Starbucks with your empty five gallon bucket. You can order mushroom spawn online. 5. Transport. Need to move water or soil? The five gallon bucket works great. 6. Post base. Any kinda post placed in a five gallon bucket and then filled with concrete isn’t going anywhere. Mail box post? 7. Recycling station. If you cut the bottom off a bucket and then sink most of the bucket in the ground. You can then throw household recyclables like egg shells, banana peels etc. in it and then cover with soil when full. Good for the garden. 8. Minnow bucket. Works great. You can get an inexpensive battery operated aerator to keep them alive much longer. 9. Making fertilizer. This is a little strange but stinging nettles make great fertilizer. You basically put a bunch in a five gallon bucket and then cover them with water. After a few weeks pour off the water and dilute it about ten to one. It is powerful stuff! 10. Bug out bucket. First aid supplies and food store well in a five gallon bucket. An additional item that makes the buckets much more usable it Gamma lids. They seal tight and work well.